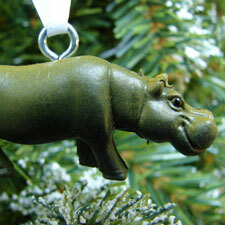 No holiday tree is complete without a hippo and our grazing hippo is happy to hang out on yours. He's small but cute and seems to have a cheerful grin. Made of finely painted hard rubber, our little green hippo measures about 2" long.